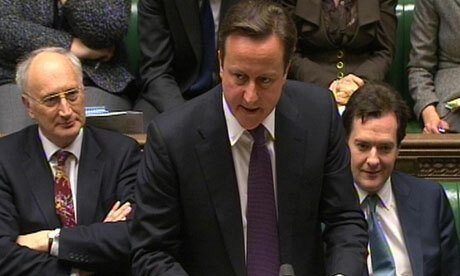 From guardian.co.uk, by Nicholas Watt, chief political correspondent, Monday 12 December 2011 15.44 EST – Eurosceptic ministers are to tell David Cameron to stand up to Nick Clegg and block the 17 members of the eurozone from using the institutions of the EU to police their new fiscal compact. In a sign of the determination of the Eurosceptics to maintain pressure on Downing Street, it is understood that Iain Duncan Smith and Owen Paterson have agreed that the prime minister must adopt a tough stance. The prime minister delighted Eurosceptic ministers when he indicated in Brussels in the early hours of Friday morning that he was prepared to prevent eurozone members from using the European commission and the European court of justice to enforce their “fiscal compact”. France, Germany and the European commission are planning to adopt a hardline approach in their negotiations with Britain over the use of the EU institutions. France and Germany decided to agree a new treaty among the 17 members of the eurozone – plus other member states who want to sign up – outside the formal framework of the EU after Cameron vetoed a revision of the Lisbon treaty. The commission will argue that it is right to use the institutions of the EU to enforce the rules of the new treaty because around three-quarters of the “fiscal compact” is already established in EU law. Commission sources also say that any member state can take another member state to the European court of justice (ECJ) under article 273 of the Lisbon treaty. Downing Street dismisses this argument because it says that the ECJ can only enforce matters referred to in EU treaties. The final parts of the “fiscal compact” will be established outside EU treaties. There is particular irritation with Jon Cunliffe, the former Treasury official who is Cameron’s senior adviser on Europe. He is being blamed for cutting out the Foreign Office from the negotiations in advance of the summit, and for failing to give the French and Germans enough time to digest Britain’s demands on financial services.